You want to manage your VAT codes. Description of the VAT page. Edit, create, activate or de-active a VAT code. 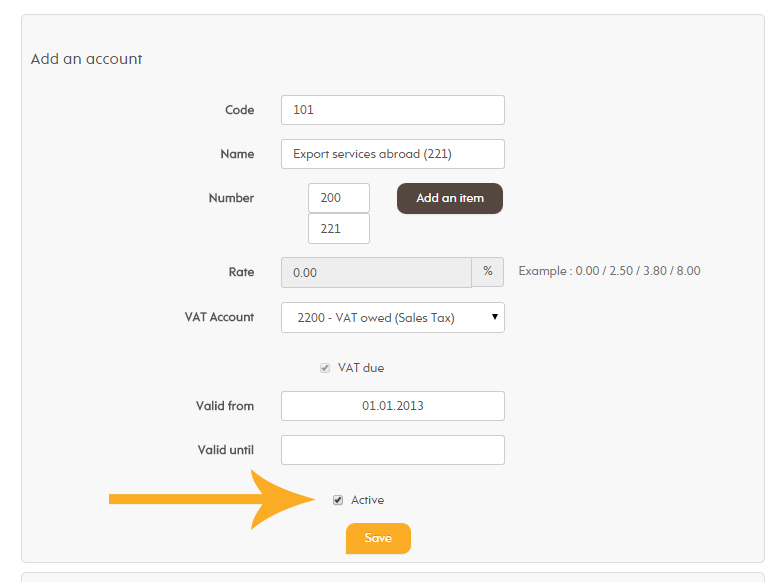 Create a VAT Code: With this button you can create your own VAT codes. This is not recommended. We created already most of the used VAT codes which you need to activate if needed. Code: Identification number of the VAT code. Name: Description of the VAT code. Number: Number(s) where the linked amount need to be put in the official VAT report. Rate: VAT rate in %. VAT account: Offset account where the VAT amount is booked. Valid from: Start of the validity of the VAT code. Only booking within the validity dates can use the VAT code. Valid until: End of the validity of the VAT code. Active: Active codes are shown in the table and can be used in the bookings. Show all codes: Show all actives and inactives codes. Edit: Edit the selected VAT code. 2) Once you pushed the button edit, the edit mode open where you can parameter the VAT code. The most important one is the activate/deactivate functionality. Activated VAT codes are usable for bookings. If you have a question, please contact support@ezycount.ch.